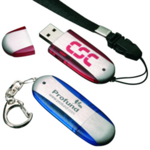 The Branded USB Flash Drive has become one of the UKs most popular corporate gifts. Obviously you don't get much advertising exposure and they are small and spend most of their lives in someones pocket or under a desk. However, the Personalised USB Flash Drive is always well received and are great for loyalty and customer relations. Our USB Flash Drive Range includes all the different sizes and shapes that you could ever need. For more information prices and samples on USB Flash Drive click here and fill in the contact form and we'll reply ASAP. Click through for the A-Z list from Calendar Lady Promotions, Personalised usb Flash Drives and many more corporate gifts.